Kettlebell squats and the way you hold the weight makes a big difference to your workout. Squats are difficult to perfect on their own, but adding a weight makes them a lot harder. Try weighted squats with your kettlebell in the rack position. This is when you rest the weight in front of your body at shoulder-level versus holding it down at your side. If you’ve never done a squat before, then I’d suggest learning the correct form first. However, once you’ve got the squat down, you’ll most likely want to challenge yourself further. Tweaking the squat with an added weight is a great way to do this. Last Tuesday, celebrity personal trainer and founder of NYC based Drive495 gym, Don Saladino, posted an Instagram video. He has worked with celebrity clients like Blake Lively, Ryan Reynolds, Hugh Jackman, many others. In the video. you can see Saladino demonstrating single-arm rack, kettlebell squats. He also explains exactly why you need the rack positioning. This is also a really helpful video if you’re looking for tips on how to position yourself if you were holding an actual barbell in front of you. Using a barbell can seriously up your squat game. Saladino says that he absolutely loves squatting in the rack position because it allows you to squat with much more ease. This is important because as a coach myself, I find that most people struggle to get themselves into a squat without pulling their back or hip out. Saladino also adds that you’re working so much more than just your glutes and abs. You’re actually giving your abs and core a killer workout. 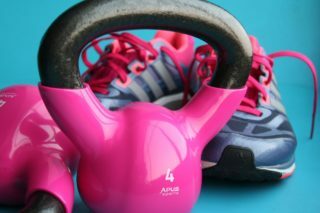 Just like Saladino said, the use of the kettlebell actually makes you more efficient at the exercise. It makes the ‘squat’ seem a lot easier. For whatever reason, injury or just plain old inflexibility. You might struggle with mobility issues when squatting. Interestingly, if you add a weight in front of your body this can evenly disperse some of your own bodyweight and allow you to squat with less difficulty. Mark DiSalvo, New York City-based certified strength and conditioning specialist, tells SELF that to do a ‘rack-squat’ with the correct form, you need to stand with a wider stance than normal and angle your toes out slowly. He recommends doing this rather than pointing your toes straight out to the front. as you would in a traditional squat, Stephanie Mansour, Chicago-based certified personal trainer explains that when you position your body in this way, you are able to protect your knees and back as you add weight onto your squat. Therefore, it can help you squat to with much more depth than you would reach in a standard squat position. This is basically what happens when you use a kettlebell during a squat. By placing the weight right in front of your body, as opposed to in line with or behind it acts as a force pulling you forward. Disalvo explains that the only way to prevent this force from pulling you forward onto your face is to engage your core muscles, even more. This movement is very similar to a reverse crunch. In addition, because Saladino’s exercise is completed with a weight in just one hand and not both, it’s an asymmetrical movement that requires strength in your obliques. These are the muscles along the sides of your stomach. You will also work your transverse abdominis, which is the deepest ab muscle that wraps around both sides of your body and spine. Lastly, you’ll, of course, work your rectus abdominis, which are the muscles that you think of when you think abs. More importantly, the exercise forces you to keep your body upright and because of that reason, it’s a complete exercise for your core. It’s always better to start with a lighter weight first and then when you’re comfortable work your way up. 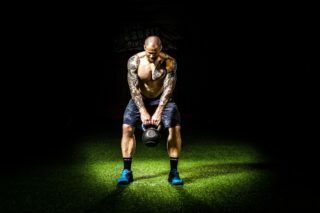 Begin with a kettlebell that weighs between 3 to 5 pounds and places it on the ground in front of you. Stand with your feet wider than hip-width apart with your toes pointed out about 30 degrees. Grab the kettlebell with both hands and bend your knees. Press through your heels and squeeze your glutes to stand up. Grip the kettlebell handle with your right hand to free up your left hand. Put your left hand in a ‘high five’ position with your thumb sticking out. Next, hook your left thumb around the middle of the handle and curl your fingers over the top. Use your right hand to support the base of the kettlebell and flip it so that the handle is facing into your chest and the base is pointing out to the left. When you feel comfortable in this position, remove your right hand so that the kettlebell is supported by just your left hand. The base of the kettlebell will rest on the front of your left shoulder. Do not try to swing the kettlebell yet if you are not familiar with this movement. When gripping the kettlebell, make sure your elbow is under the kettlebell. Do not flare your elbow out to the side. Be sure to keep your wrist straight and not bent backward. Engage your upper back muscles and retract your shoulder blades. This is the starting position. Bend your knees and hinge forward at the waist as you press your glutes and hips back to lower yourself down into a squat, keeping the kettlebell fixed in position, your chest up, and your spine straight. Go as low as you can. You must stop when your quads are parallel to the floor, maintaining your form. Once you’ve reached the bottom of the movement, drive down through your heels to push yourself back up to standing. Squeeze your glutes at the top of the movement. This is 1 rep.
Do 10 reps. Switch the weight to your other side and do another 10 reps. It is very important that you do not cave your knees inward and rather push them outward. If your lower back starts to hurt, think about squeezing your core to redirect the force. Always Keep your eyes looking a few feet in front of you. Kettlebell squats are not necessarily complicated, but there is a lot to think about. It is also a lot more challenging to balance yourself than you think when watching Saladino demonstrate the move. If you’re struggling to stay balanced, grab a lighter weight and perform the squats with a weight in each hand. Technically you will be using more weight, however, the exercise will actually feel easier when you eliminate the asymmetrical element. If it is still too challenging, then you may need to modify and regress to using only your body weight. It’s better to perfect the standard squat before overloading with a weighted progression. And if you have any injuries, always consult with your doctor first. The most important factor to keep in mind is to always focus on the quality of repetitions, rather than the number of repetitions. This is not a cardio exercise. It is a total-body strengthening movement, so you need to take your time. Phytonutrients and phytochemicals they contain a certain amount of resilience benefits that are essential for our health. Here’s why you need more of them. Skye is a Transformation Coach and Lifestyle Blogger who helps people achieve their best selves inside and out. She encourages everyone to love their bodies more! And believes that together we can achieve anything! If you can visualise it, you can have it. She is passionate about all things wellness, fitness and fashion. And that the mind, body and soul should always interlink. 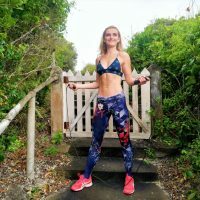 She specialises in coaching Jump Rope HIIT paired with Bodyweight, Strength, Yogalates, Boxing and Kickboxing movements. She has a keen interest in high-quality, activewear apparel and represents different brands. Lastly, she believes that the best results are achieved by doing something you love! The point is to have fun, explore more and get outside of your comfort zone. Facilitates fun, fit, adventure retreats in Watamu, Kenya. Bachelor of the Arts Degree in Fashion at LISOF. Budokon Yoga and Mixed Martial Arts Enthusiast and aspiring Teacher/Yogi.